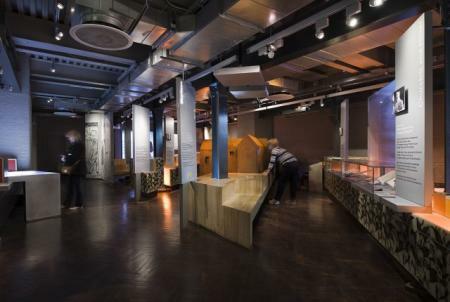 Travel back in time to WWII and the days of the Blitz in the Cabinet War Rooms, where Churchill and his aides made the decisions that helped to win the war. From interactive maps to expert staff, our tester picks the highlights for children and families. Junior James Bonds will love cracking the secrets found in the top-secret base from which the Second World War was won. 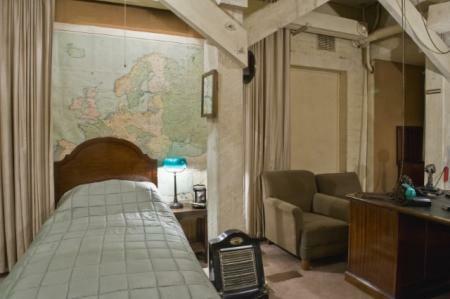 The Churchill War Rooms in London is a fascinating foray into a golden era of intrigue and covert operations for all ages – plus an illuminating look at the life of one of history’s greatest figures. Dominique Dinse visited with Oliver, 10, and Ben, 9. 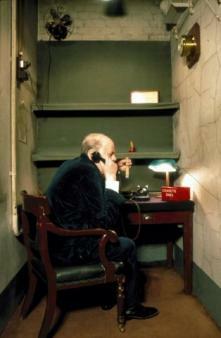 Tucked away in Whitehall are the original Cabinet War Rooms, a reinforced underground bunker that sheltered then prime minister Winston Churchill and his government during the Blitz. It’s here that key players in WWII made crucial decisions that would steer this country through its darkest days. Left just as it was when the doors closed on its top-secret operations for the final time on 16 August 1945, this warren of rooms reopened as a museum in 1984, so that future generations could marvel at the ingenuity that won the war. Although WWII mechanics seem decidedly low-tech when viewed by kids weaned on tablets and iPhones – wallmaps with coloured pins show the position of ships and there are bakelite phones and blotters and ink pens on the polished wooden desks – the exhibition is brought bang up to date with the addition of hands-on interactive screens and colourful displays throughout. There’s a discernible awe-filled hush from little visitors as they descend deep underground (with a handy lift for those with buggies and toddlers), so awesome is the setting. Then there are the lifelike figures of Churchill and his aides to wonder at. Happily, among the warren of subterranean rooms there’s lots for littlies to explore. Most popular are all the hands-on props handily placed at small-eye level – smart uniforms and caps to try on, old telephones to make sense of and typewriters to have a bash at. In the Churchill Museum, colourful artefacts are cleverly placed in low cabinets to catch inquisitive eyes; the Toby jugs showing Winston’s cigar-chomping caricature in particular were making the littlies giggle on our visit. Even the youngest visitors were intrigued by the exhibition Undercover: Life in Churchill’s Bunker, which tells the story of the hundreds of staff who worked in the Cabinet War Rooms – typists, clerks and telephonists as well as military policemen and Royal Marines who helped guard the bunker. There are original letters to and from these key workers from Churchill himself, and photos showing just what a thrilling time it was. 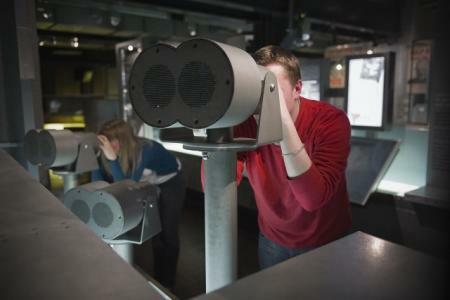 Interactive displays aimed at this group include binoculars showing wartime scenes – just as if you were in the trenches – and Morse messages to try and decode. All the props that so entertain the tiniest visitors – uniforms to try on and telephones to try – are brightly labelled with simple descriptions of who wore them and why they were so useful in the war. There are lots of audio displays too, so curious visitors can listen to actual former workers here explaining what it felt like to work in this exciting place during the war. 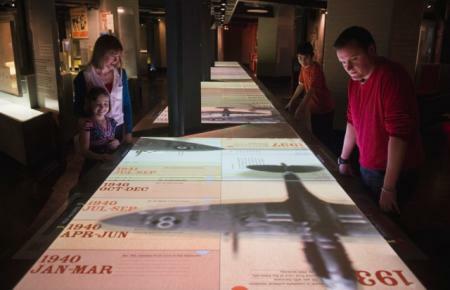 Hands-down, the most popular attraction with this age group is the brilliantly innovative Lifeline – a 15metre-long table stretching diagonally across the biggest room in the museum, one long seamless screen spanning the war years and divided by date. Simply tap on any date to have what happened on that day brought brilliantly to life with sound and vision. And it’s not just war-related information you’ll find – after the boys stumbled on the release date of pre-war big-screen thriller King Kong, the museum rang out to the sounds of a bellowing gorilla and Fay Wray’s terrified screams! Older kids who have been studying the Second World War will find those tumultuous years brought to life in the war rooms and museum. To see actual battles played out on maps with pins for battleships and fighter squadrons where today we would use computer imagery is pretty difficult for pre-teens to get their heads round. There’s plenty of in-depth information about battles and key players on the Lifeline table, as well as on the displays in each room and around the walls in the corridors – seemingly no space is left spare, making the most of the rather steep entrance fee. Each tiny space in the Cabinet War Rooms is atmospherically lit and full of period detail. The Map Room contains one particularly human detail: on the desk of the Chief Map Room officer is an envelope marked with his name and the actual precious rationed sugar cubes that he hid in it, left forgotten in his drawer in all the excitement of VE Day, until the building was reopened as a museum. In the Churchill Museum are films from his life right from childhood to an elder statesmen, as well as precious personal artefacts everything from his baby rattle to his Nobel Prize for Literature. There are recordings of his best-known speeches and letters written in his own hand, all imaginatively preserved and brought to life for future generations. The talk as you enter the museum, which is every bit as entertaining as the audioguide you get free with your tickets. Before you embark on the tour through the warren of tiny rooms and corridors, you’ll find yourself in front of a the War Cabinet Room, set up behind glass to look just as it was at 5pm on 15th October 1940, the date of the first meeting of Churchill’s War Cabinet. The 23 seats around the table include Churchill’s statesmanlike wooden armchair – still visible in its wellworn armrests are the marks clawed by Churchill’s fingernails during the tense discussions here. Experts bring this room to life for you by pointing out such minor details that you might otherwise overlook. And don’t miss the chance to quiz the staff here, some of the most knowledgeable we’ve met. One staffer told us how his mother worked at Bletchley Park during the war – a job so top secret that none of her family ever knew until the embargo on wartime secrets was lifted recently and her son found out with surprise what his mum did in the war. The museum’s Switch Room Café – a light, bright space cleverly decked out with wartime advertising – is imaginatively stocked with war-themed provisions, though all the homemade offerings are far too good to be considered wartime ration fare. Our favourites were “Dig for Victory” soup, served in a tin mug with that jaunty wartime motto on the side and with a crusty bread roll (£4.50), and “wartime stew”, a chunky mix of meat and veg plus bread roll (£7.50). Other offerings include a choice of sandwiches, for £4.50 each, plus sausages and mash for £7.50 and jacket potato for £5.50. There’s also a great kids’ menu that changes daily – offerings when we visited were fish fingers with peas, or rigatoni pasta with tomato sauce, each £4.50, and vegetable crudités with hommous, for £3.50. Just across the street is beautiful St James’s Park, so if you’re packing a picnic, head straight for here after your visit so the kids can stretch their legs and feed their sandwich crusts to the resident ducks. The Churchill War Rooms are in the heart of London, just a few minutes’ walk from other tourist favourites such as Big Ben and the Houses or Parliament, and Westminster Abbey. The nearest rail stations are Charing Cross and Victoria and the nearest tube stations are Victoria, Charing Cross and Westminster. Tickets are £18 adults, £9 children 5-15 years (under-fives go free), £14.40 concession. Family tickets are £31.50 (1 adult, 2 children) or £47.25 (2 adults, 2 children). Admission includes free audio guide. 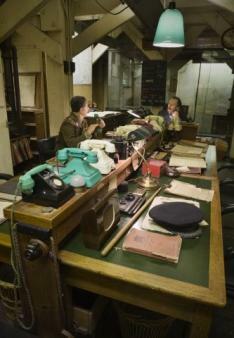 Churchill War Rooms are open all year round (except 24-26 December), Monday to Sunday 9.30am-6pm, last admission 5pm. The shop – cleverly located in the original officers’ mess – is a brilliantly stocked space where Vera Lyn plays over the speakers and you can buy wartime memorabilia of all sorts. For under a fiver little ones can purchase Imperial War Museum keyrings or pens for £1.50, toy planes, tanks and flip books for around £2 and Keep Calm and Carry On magnets for £3. Also popular were ration era-style packs of sweets for £4. The Churchill War Rooms are an arm of the Imperial War Museums whose website has a wealth of free, downloadable classroom learning resources. Everything from Conscription and Recruitment to D-Day Teachers’ Resources and a whole host of fascinating facts about Churchill is covered with facts and figures and colourful information including first-hand accounts.